I took this picture back in November while visiting West Texas. It seems a perfect example of the past meeting the future. 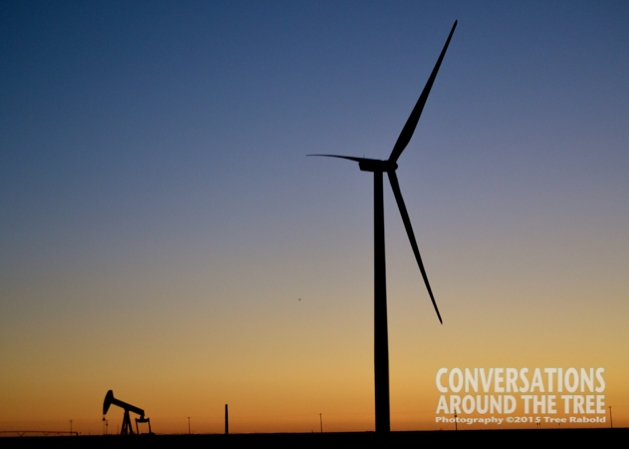 This entry was posted in Uncategorized and tagged 365 photos, oil well, photography, sunset, West Texas, wind turbine on February 23, 2015 by treerabold. Very nice. We have a lot of those windmills in our area, but apparently people who live near them, hate them. A wind energy company was trying to put them in one of our local rural communities and they had signs and protests at town meetings, etc. They didn’t go in. I think they are beautiful. I could watch them all day. I might feel different though if they were in my backyard! Thank you Taylor! I appreciate your kind words! I’m not sure how much success I will have nominating others but I will give it a try. I hope to have some time to complete the rules tomorrow….now on to the B&W challenge! Very nice picture. I like the past and future thing. Thank you Colleen! Good to hear from you….its been awhile. Great shot, Tree. Love the composition and colors! and technologies, Tree. And a beautiful photo to boot!